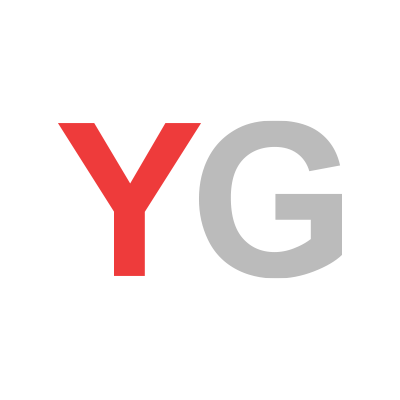 October 08, 2018, 1:38 p.m.
With the war in Afghanistan now overtaking the Vietnam War as the longest conflict in America’s history, a new YouGov survey reveals that the majority of Americans would support drawing US involvement to a close and bringing the troops back home. 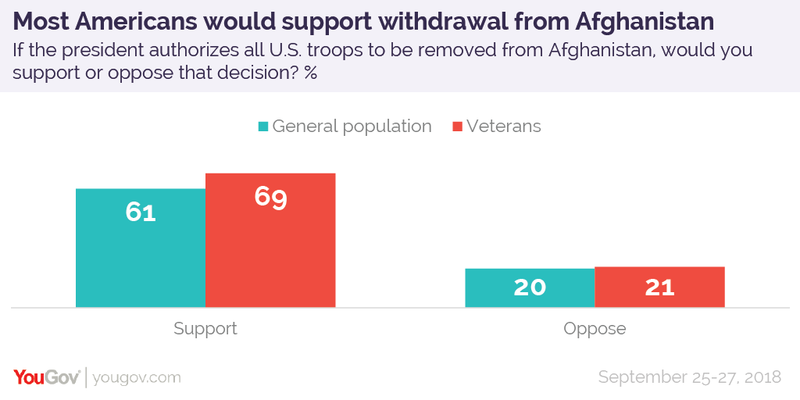 The results show that if President Trump were to announce that he was ordering the withdrawal of all troops from Afghanistan he would have the support of 61% of Americans. A parallel survey of current and former armed forces personnel found that such a move would be even more popular, with 69% in support. By contrast only 20-21% in both groups would oppose the withdrawal. 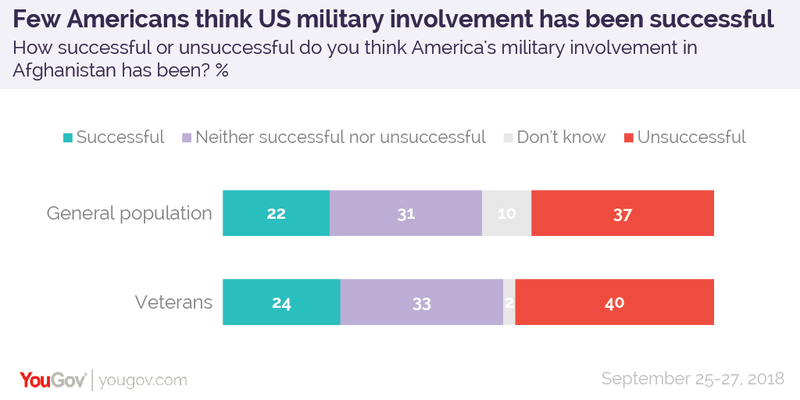 More than 17 years into the conflict few believe that US military involvement in the nation has been a success. Just 22% of the Americans, and 24% of current and former service personnel, say the mission in Afghanistan has been successful. A further 31-33% say it has been neither successful nor unsuccessful, while 37% of the public and 40% of veterans say that it has been unsuccessful. Many critics of the war in Afghanistan have blamed the lack of success on the absence of a strategy for operations in the country. Such a view seems to be shared by the American public, with the majority (55%) saying the US does not have a strategic objective for the conflict (as do 59% of veterans). Opinion is mixed on the justifications for the continued US presence in Afghanistan. Few Americans or service personnel (24-25%) believe that it is the responsibility of the United States to create a liberal and democratic nation there. The public are, however, more likely than not to think that a lack of central government control in Afghanistan poses a threat to the safety of the United States. Almost four in ten (39%) believe that such a situation does pose a risk to the US, compared to 30% who don’t. Amongst veterans the split is greater still, with almost half (49%) saying that the US would be under threat from an anarchic Afghanistan, compared to 35% who disagree. Nor is the public willing to countenance negotiating with the Taliban to bring an end to the war. Americans oppose such a move by 41% to 36%, while among current and former service personnel opposition stands at 51% compared to 40% in support. 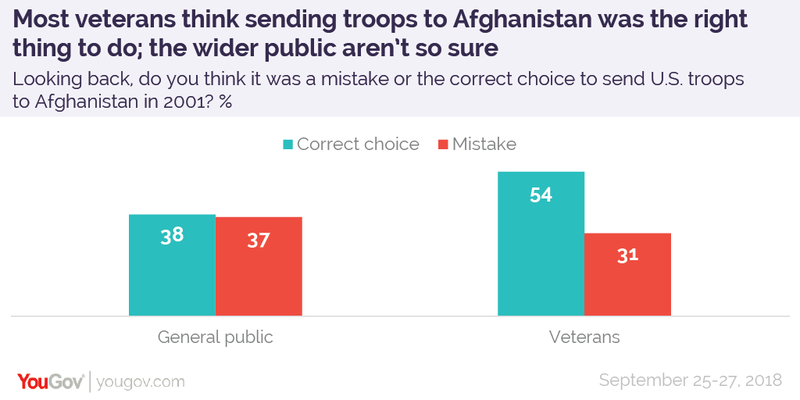 Despite the gloomy attitudes to the situation in Afghanistan today, the majority of veterans (54%) believe that President Bush made the right decision in sending US troops to Afghanistan back in 2001. The wider public aren’t so sure, however, with only 38% saying the same, and an almost identical figure (37%) saying that it was a mistake. The results of the survey come at a time when the public is sceptical about the US global military presence. Close to half of Americans (45%) and veterans (49%) think that the US should be less militarily engaged worldwide. Around a third of each group (32-33%) would keep engagement levels about the same, while 14-16% want to see them ramped up.